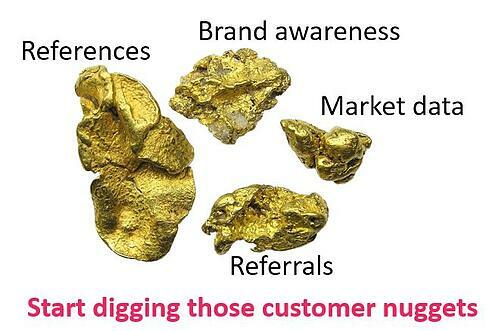 When presented with this problem my response is the same – “you're sitting on a goldmine!”. All you need to do is turn your product/community users into advocates. Imagine the impact of capitalizing on a totally new crowd of the users and the community (many times triple the size of your current contact base). It’s pretty easy to do, and crucial for substantial business growth. Why is this a problem? What is the impact of not communicating with the actual users? Although there are multiple impacts I’ll touch on two implications I see as core issues – the impact on marketing and on the product. Product wise your product feedback isn’t from real product users when you are surveying only the identified contacts in your CRM, which leads to investment in what your contacts perceive as requirements and not what the users actually require. That can lead to reduced product value, followed by reduced usage, which combined, lead to an overall lack of retention and satisfaction. Marketing wise your understanding of the product core values is dependent on perceived values by contacts and lacking earned value by users. So, your marketing messaging is touching only part of the product value (an important part, but not the whole picture). Additionally, your understanding of the buyer persona and who can impact the purchase is limited, therefore marketing reach is limited. Finally, marketing gets a hit on the depth of the customer's voice – you miss out on receiving detailed online reviews, insightful references, multi-angled customer-stories, and more. If the problem sounds familiar and the implications make sense to you – let’s move on to the 4 steps toward resolving these two challenges. (BTW - if you disagree with the problem or the implications – I’d love to hear why in the comments below or contact me, but don’t spend time on reading the proposed solution 😊). Now that we have the WHY, let’s dive into the WHAT, and close with the HOW. Leveraging this structure will be most effective and actionable for your benefit (following the wisdom of Simon Sinek - Start with WHY). User outreach – get in front of the actual users. Don’t rely on email lists from CRM or mailing tools! Create a 2-way communication mechanism with your product users. This can be done online and in offline activities such as events, in training sessions, during user group discussions, and through their colleagues. User identification and creation of customer silos – step 2 is basically knowing who’s who. Create an easy way and benefit for users to provide key information such as industry,role, location, and product usage data such as version and how long they have been a customer. Ideally, some of these metrics can be provided by your own systems such as CRM, and only 2-3 required pieces of the puzzle should be actively requested from the user. Your goal is to map and extract actionable information. For example, 1-year old customers in the US, or a criterion of companies smaller / bigger than X, or a role criterion like system admin / key user. Create user-type groups that make sense for your business. Silos that help you target your full customer-base / users by cohorts. Example attributes that can be collected and leveraged for user targeting. Target your ASKs – the next step is to start engaging and marketing to your user-type cohorts with specific requests for references, user-generated content, product feedback and any ASK you have. Even if you target the whole audience through your community forums, for example, being able to sort responses to user-types will make the whole difference in insights and actions. For example, if feedback on training quality is mixed yet without customer data - it’s hard to know what to improve. However, if you can see that the good ranking comes from newbies and the bad ranking comes from veteran customers – you have the insight to improve retention-customer training. Or if you need a customer reference and you know it’s a sales operations prospect, you will want a sales ops user to be on the line – relevance grows conversion. Go pro, create a flow – the final step is to build the framework for ongoing interaction with your community / users, and the ability to analyze customer inputs by user types. This will allow leveraging the full capacity of your customer base for advocacy and feedback. It will enable granularity in marketing and product, and help the organization be more specific and focused on product and marketing initiatives. Whether you leverage a customer marketing platform or customize your CRM or a customer engagement system of any type or start with excel – be sure to create an ongoing cycle of the steps above. How do you do it? Well, there are several ways to go, depending on how many user-cohorts / types your product may have, the number of users overall, how you currently engage with them, and whether you have a support community. Creating a cross-company understanding that not all customers / users are equal and that you need to deep dive into the customer base and users / community. Make sure you sync on the objective and process with all stakeholders, including sales, marketing, product and customer success. You’d also want to have a customer advocacy program defining what’s in it for them. There are several means of motivation for users / the community. Define your toolset – for super-simple initiatives, excel and email will do. If you want partial automation you can customize relevant systems such as CRM, your support forum, marketing automation, and chat. For full automation, you can utilize a customer marketing platform. Determine a budget for 6-12 months. Programs have rewards, systems require a license or customizations, a good launch campaign may require money… you could baby-step with several thousands of dollars in the first year or aim high from the get-go. Define an owner, most likely from marketing / customer marketing or customer success. 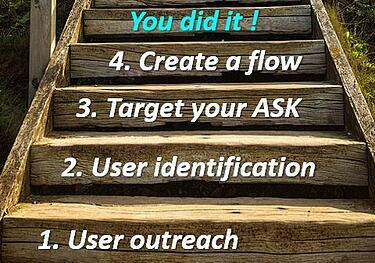 Make sure you cover all 4 steps discussed earlier in your thought process. You might not go pro on day one, that’s fine, but have a path in mind. For example, create a basic program, use excel, have a part-time owner and reach 100 new / un-touched users in 3-6 months. Create a smaller framework just to see the impact, then make the case internally to go pro. On a small scale, you may leverage freemium. Consult and leverage best practices – seek customer marketing managers and customer advocacy professionals to discuss what they’ve done. Feel free to reach out to me and consult as well. And yes, a designated customer marketing platform, such as Crowdvocate, can streamline the whole flow, and automate outreach and capture the voice of all your customers - including the community and product users. These strategic initiatives will impact your marketing and product dramatically, as well as your position in the company. The “side-effect” of this customer-centric marketing approach will increase brand awareness, drive higher customer satisfaction, create better product alignment with customer requirements, increase more quality leads with lower acquisition costs, and lead to higher lead conversion rates. I challenge you to set a customer marketing goal, a deadline (January 2019 the latest), and a plan for launching user advocacy, ultimately turning your community and product users into advocates. Gal Biran is the CEO & Co-founder of Crowdvocate. A savvy cross-industry marketer and customer first advocate, leveraging 19 years of B2B sales & marketing experience in global tech companies, such as Microsoft and Alvarion. His entrepreneurial bug led him to found a Tel-Aviv based marketing agency in 2013, that focused on marketing technology and channels. While supporting B2B enterprises and implementing automation Gal realized that marketing is somewhat broken - the funnel is digitized up to the point where a prospect becomes a customer, however, customer marketing and customer advocacy were not digitized and the most popular tool reference managers use is excel.🤔 Gal envisioned a different way technology can impact B2B customer marketing and impact sustainable growth based on the voice of your customers.